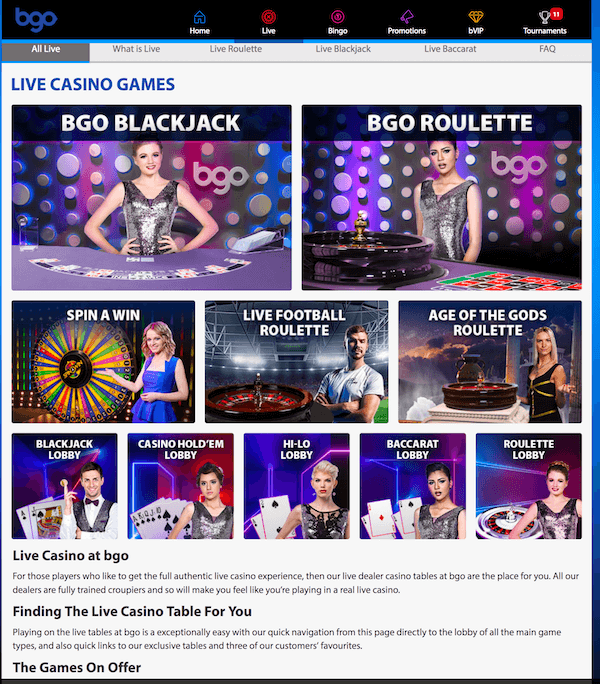 BGO was launched in 2012 with an objective to deliver the best casino, bingo and slot games under one brand. The team is continuously fighting to rank their site among the best online casinos with a portfolio of over 700 casino games, bingo and live dealer games, all accessible via download-free and easy-to-manoeuvre website hosted by one popular character or another. Until recently, it was Verne Troyer (aka Mini-Me) welcoming players and promoting current special deals, and now Paris Hilton does the job instead. The brand is owned by BGO Entertainment Limited and the Casino licensed by the Alderney Gambling Control Commission as well as the UKGC. BGO is a Playtech-powered gaming site with more than 600 slots and 100+ other casino games which are either RNG-driven or play live. Its library also includes a good number of NetEnt, NYX, iSoftBet, Quickspin, WMS, Barcrest, Blueprint Gaming, IGT, Eyecon and Bally products, as well as a small selection of their own titles. Free-play is enabled but only once you register and sign in. To start with, the operator will provide 10 free spins following registration and mobile verification. You’ll be offered to use them on one of 4 slots (currently Fishin’ Frenzy, Eye of Horus, Slots O’ Gold and Diamond Jackpots). What’s great is that there are no play-through requirements attached and whatever you win can be withdrawn whenever you wish. Spins have a value of 10p each and validity period of 3 days. New members can additionally claim up to 100 free spins, 2 for each £1 of their first deposit. These also come free of wagering requirements and no max win. A deposit of £10 or more is needed to qualify, but as is frequently the case, Skrill and Neteller payments will not make one eligible. Players can alternatively opt for Live Casino and Table Games welcome offer and thus double their initial deposit up to £200. In order to do so, they’ll have to fund their accounts with £50 or more and use code LIVE. Bonus can be used to play any Roulette and Blackjack game, Spin-A-Win, 3 Card Brag and Casino Hold’em – both live and virtual. Betting on other games will not count towards wagering requirements of 40x the bonus amount. Bets on 3 Card Brag contribute 50%, Casino Hold’em 25%, all Blackjack games 20%, and Baccarat 0%. When it comes to other games, BGO makes a difference between low, medium and high coverage wagers, low meaning less than 30% of the wheel/table, medium being 30-66%, and high more than 66%. Subsequently, Spin-A-Win contributes 100% (low coverage), 25% (medium coverage) or 0% (high coverage), and Roulette 50% (low), 25% (medium) or 0% (high). Do note that this welcome offer expires 7 days after being credited. Top games section displays the most popular titles, among which NetEnt’s Starburst and Jumanji, Playtech’s Wild Wishes, Paws Of Fury by Blueprint Gaming and IGT’s Pixies Of The Forest. Eyecon’s Beat The Bobbies might be especially appealing to UK players, and one can obviously expect to find tons of great Playtech games such as Heart Of The Jungle, Wings Of Gold, Batman series and a range of other superhero titles along with multiple progressive jackpots. BGO additional offers some of its own products, namely Jurassic Island, Jungle Trouble and Murder Mystery. The first will take you back to when dinosaurs were still alive and kicking. Wild symbols expand to fill their respective reels, while Scatters launch a pick & click affair prompting the player to pick one of four features. Multiplier Free Games are a highly volatile option with all prizes tripled, Carnivore Free Games of medium volatility use only high-win symbols, equally volatile Raptor Free Games plant stacks of expanding Wilds, and Hot Shot Hunter Bonus invites one to blast dynos with their blunderbuss to claim instant rewards of up to 180x the total stake. Jungle Trouble features Scatters which create x2 Coconut Multipliers at the top of their respective reels, and each successive one increases it up to x5 during the base game and up to x10 while spinning for free. If Wild monkey appears on the same reel, multiplier will drop and boost the win accordingly. Scatters are also free games triggers. You’ll have a choice of Multiplier Free Games, High Win Free Games playing exclusively with high value symbols, and Nudging Wild Free Games with low volatility. If you fancy playing a detective, launch BGO’s Murder Mystery and make use of 4 special features – Wild spins with extra substitute icons, Reveal Spins with question mark symbols all transforming into the identical paying symbol, Clue Hunt which sends you hunting for weapons to earn cash prizes, and Multi Spins with tripled payouts. Murder Spins can randomly trigger on any spin; Weapon Spin reveals the murder weapon and adds up to 12 question marks which then transform into the same weapon, while Murderer Spin reveals the culprit and makes added question marks transform into the same suspect. Playtech-powered Live Casino is home to 25 tables with different bet limits. Football fans can join Live Football Roulette and simultaneously indulge two of their passions. If you don’t find this particular sport all that interesting or simply want to focus on the gambling action, launch one of the standard game variants, Speed or Slingshot Roulette, or go for a progressively increasing jackpot in Age Of The Gods Roulette. Lobby also gives access to 7-seat and Unlimited Blackjack, standard, Mini and No Commission Baccarat, Casino Hold’em and Three Card Brag. One can play Live Hi-Lo for £1+ per round or invest as little as £0.1 in Spin-A-Win – a game using wheel of fortune mechanism and currently also available as a Halloween edition. For players looking for a more exclusive experience, the Casino has supplied BGO Blackjack with limits of £5 to £1,000 and BGO Roulette with a range of £0.50 to £10. Dealers and pit bosses have been trained to professional standards and all live games are monitored and recorded 24/7. 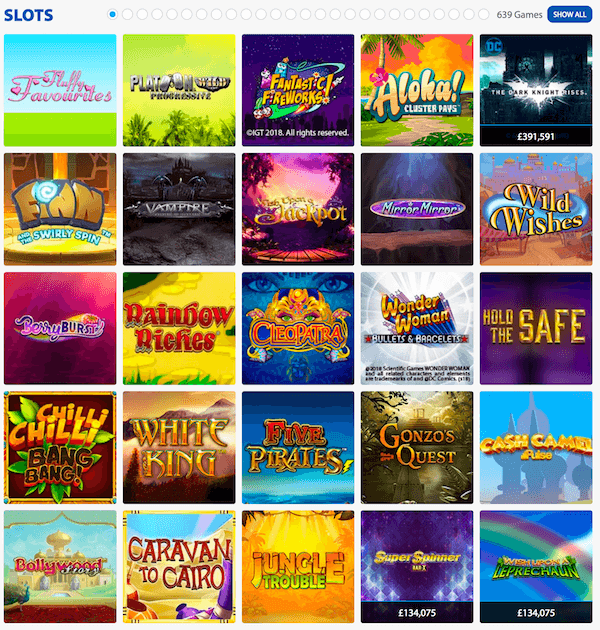 BGO Mobile Casino is just as easy to access via the mobile browser of a smartphone or a tablet. The only significant change to site layout is a handy menu button which one can use to access every single section. Shrinkage is kept at minimum; you’ll get to pick among 540 slots and 80 other games, including those playing live. 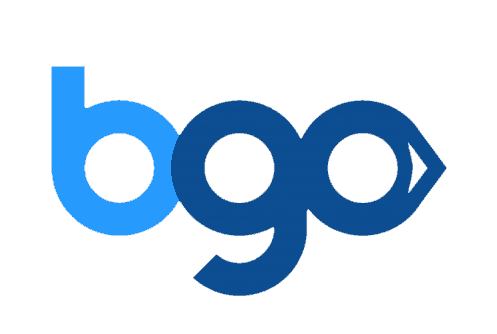 Fans of mobile apps will be happy to know BGO has made them available both for iOS and Android devices. BGO supports the usual payment options such as Visa, MasterCard, Maestro, Neteller, Skrill and PaySafeCard, but also not as frequently seen PayPal. Unfortunately, sending money in any direction comes with a cost. Deposits of less than £500 incur a 2.5% fee with a minimum of 50p, regardless of which method you’ve chosen to fund the account with. The operator will also charge £2.50 for each withdrawal. If you request an international bank transfer, they may also charge an additional fee of £15. Players are able to collect a minimum of £20 per transaction and a maximum of £5,000 per day, £25,000 per week and £100,000 per month. Cash-out requests remain pending for up to 24 hours and during this time can be reversed. Withdrawals can take 3 to 5 working days if payment is made via credit cards or Bank Transfer, but will reach you pretty much instantly if using eWallets. 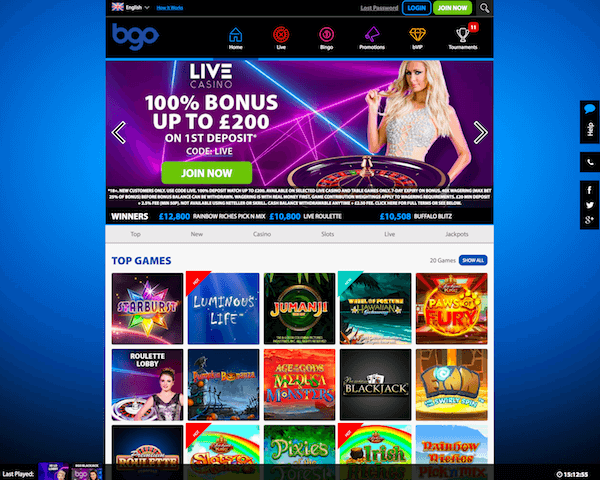 Be it the ease of use, generous choice of games, diverse promotional offering, creative advertising or all combined, the fact is BGO has managed to build a solid fan base in the UK market. Playtech is able to supply high quality games within each and every category and products provided by other developers are a welcome bonus. There is a range of seasonal and ongoing special deals to pick from, regular tournaments to participate in, and Boost rewards stored in the player’s personal vault as a thank you for their loyalty. What’s not so hot is that direct support is only available during limited hours, and a major downside are fees charged with every single deposit and withdrawal. Especially since the majority of competing sites won’t make you pay for either, or will at worst attach fees only to some of the available payment options.